A light and effective dual purpose oil, which can be used as a pre and after wax treatment. The oil is enhanced with an exotic fragrance of nourishing Coconut Oil and invigorating Kaffir Lime which helps to prepare and soothe skin throughout the waxing treatment. HIVE Coconut and Lime Pre and After Wax Oil forms a barrier on the skin, therefore the wax only adheres to the hair - resulting in a clean waxed area. For professional use only. 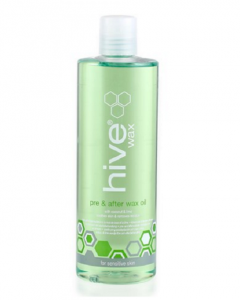 Soothes skin before waxing and removes residue after waxing. A luxurious dual acting formula.